The Grumpy Economist: Inflating our troubles away? These are comments I gave on "Inflating away the public debt? An empirical assessment" by Jens Hilscher, Alon Aviv, and Ricardo Reis at the Becker-Friedman Institute Government Debt: Constraints and Choices conference, April 22 2017, along with generic comments on the conference in general. This post contains mathjax equations. Consider the government debt valuation equation, which states that the real value of nominal government debt equals the present value of primary surpluses. My first equation expresses this idea with one-period debt, discounted either by marginal utility or by the ex-post return on government debt. This paper's question is, to what extent can inflation on the left reduce the value of the debt, and hence needed fiscal surpluses on the right. The answer is, not much. The first equation seems to offer some hope. If you change \(P_t\) by, say 30%, then you devalue nominal debt B by 30%, and you can lower the steady state surpluses needed to pay off the debt by 30%. The trouble is, this only works for an unexpected 30% price level jump. 3% a year for 10 years won't do it. If people expect inflation starting next year the governments gets precisely nothing out of it. Nominal interest rates rise, and short term debt completely avoids devaluation by expected inflation. Now, this calculation (and those in the paper) makes a crucial assumption here: that nominal interest rates rise one for one with expected inflation. A possible reading of the last 8 years is that the Fed lowered both nominal and real interest rates. If so, then a rise in expected inflation might similarly leave nominal rates behind, and inflation could erode even short-term debts. Debt can run away from inflation, but if it chooses not to, it loses. Exchange rate jumps are easier to engineer, and as the paper documents a lot of US debt is held abroad. So there is a bit more of a chance that devaluation can work, which would be an interesting extension. 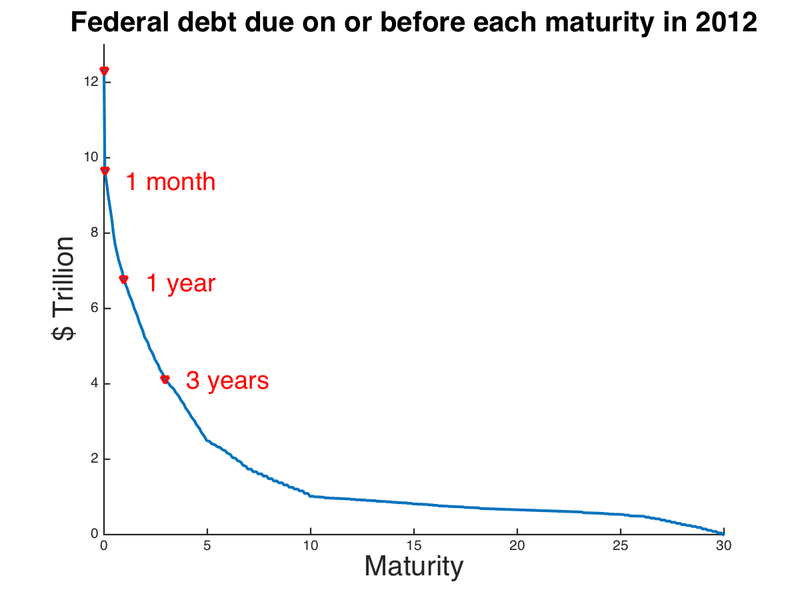 Long term debt has several useful properties for government finance. 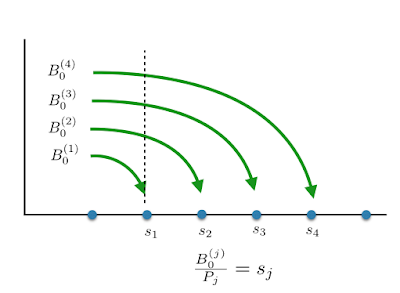 With one-period debt, shocks to the present value of surpluses s are reflected immediately in the price level \( P_t\). With long-term debt, nominal bond prices \( Q \) can decline instead and absorb some or all of the fiscal shock. Declining bond prices reflect future price level rises, so long term debt helps really by spreading the inflationary impact of the fiscal shock across time. Similarly, long-term debt buffers the fiscal impact of interest-rate shocks, as it does for a household choosing a fixed vs floating rate mortgage. Interest rate increases do not affect debt service until the debt rolls over. Long-term debt helps for this paper's question as well. The presence of outstanding long-term debt allows the government to devalue debt claims via expected and therefore slow-moving inflation. Higher expected inflation lowers bond prices \( Q \) , resulting in lower future surpluses, even with no change in the current price level \( P_t\). Cumulative distribution of Federal Debt n 2012. Each point plots the total zero-coupon debt coming due after that date. Source: Hilscher, Aviv, and Reis. Thus, for example, an announced 30% inflation in year 3 only results in a 10% reduction in the value of the debt. The slower, smaller, and longer-lasting inflations considered in the paper have correspondingly smaller effects. That's the basic message of the paper. Inflation trundling along with its current variance is quite unlikely to do anything like that. And conceivable deliberate inflation, even if our Fed knew how to achieve it, would have limited effects.
" ... to quantify the likelihood of inflation significantly eroding the real value of U.S. debt." I want to generalize the quest, and ask "To what extent can greater inflation significantly improve the US fiscal situation?" And I want to ask the converse, "To what extent is the US fiscal situation likely to result in inflation?" Both questions allow me to comment a bit on the larger issues raised in this conference as well. A government is tempted to default via inflation if debt service requires onerous taxation. At a steady state, surpluses must be r-g times the debt/GDP ratio. But r minus g is perilously close to zero! So current debt at current interest rates requires at most something like half to one percent of GDP debt service, or $75-$150 billion dollars a year. Table 1 adds up components of primary surpluses and deficits. Table 1. Components of primary surpluses. The US' big fiscal challenge is looming primary deficits. And those fundamentally come from social security, medicare, medicaid, pensions, and voluminous explicit or implicit credit guarantees. One way to think of the long-run entitlements problem is as "debts," that should be included on the left hand side. Larry Kotlikoff computes a "fiscal gap" of $210 trillion, dwarfing the $13 trillion or so of publicly held Federal debt. (The paper acknowledges but ignores these issues, for the reason that they are hard to measure. "Unfunded nominal liabilities of the government like Social Security could be included in \( B_t^j \), and the real assets (and real liabilities) of the government could be included in \( K_t^j\). Theoretically, they pose no problem. In practice, measuring any of these precisely, or taking into account their lower liquidity, is a challenge that goes beyond this paper, so we will leave them out." These numbers are imponderably huge, and sensitive to interest rate assumptions. I think it's easier to digest them by translating into flows. Kotlikoff's fiscal gap is 10.5% of his present value of GDP. So, to fix it, either Federal taxes must rise by 10.5 percentage points of GDP, from roughly 20% to roughly 30%, or spending must be cut by 10.5 percentage points of GDP. Permanently. Now. "What explains Italy's negative fiscal gap? The answer is tight projected control of government- paid health expenditures plus two major pension reforms that have reduced future pension benefits by close to 40 percent." Viewed as flow or present value, it's clear that today's debt or debt service, at current real interest rates, is just not a first-order issue for confronting US fiscal problems. They may be hard to measure, but they are the elephant in the room. We can, and should, still ask the question whether inflation would help or hurt. To first order, the answer seems to be not much. Social security is explicitly indexed, and health care costs are real. Many union contracts have cost of living clauses. Perhaps the elephant is not so inflation-sensitive. To second order, inflation may matter. "Inflation is the dean's best friend," a dean once told me. Non-indexed government wages may be slow to adjust. Medicare and medicaid reimbursement rates are sticky, with so little price discovery and competition left in health care, so real government health expenses may lag inflation. Many government pensions remain defined benefit. And inflation remains the friend of the tax code, including taxing inflationary capital gains, devaluing unused depreciation allowances and nominal loss carry-forwards. Yes, calculating the inflation sensitivity of entitlement "debts" is hard. But I suspect it does matter at least as much as inflating away the current debt, so if the question is worth asking, this answer is worth calculating. I also suspect the answer will still be that you're not going to get $2 trillion of annual surpluses or Kotlikoff's gazillions of present value out of inflation. "Higher inflation may not only lower the real payments on the outstanding nominal debt, but also change primary fiscal surpluses." Anytime debt and inflation comes up, so does seignorage. One way to think about it is that seignorage too provides a way for higher inflation to help current surpluses, rather than just be devaluing debt. Seignorage, rather than debt devaluation is the main mechanism in Sargent and Wallace's models of hyperinflations. Currency is now $1.4 trillion. Reserves are trivial when they do not pay market interest. 10% inflation would generate $140 billion of surplus. However, currency demand falls when inflation rises. Currency, now about 7.5% of GDP, was less than 4% of GDP in 1980, and that was before electronic payments. So seignorage is probably capped for the US at something like $50 billion per year, and not really going to make a dent. But on the other hand, seignorage is comparable to the size of the inflationary effects in the paper, so it probably makes sense to include it. How will it work out? Or not? How might inflation happen? So how will our fiscal problems work out? Remember this equation holds, ex ante and ex post. If current projections don't add up, something is going to change in those projections, and those projections do not correspond to expectations driving the market value of debt. So our question is, how does it hold ex ante -- why do agents value government debt so highly -- and how is it going to hold ex post? Most obviously, there could be fairly massive cuts in entitlement programs, \( G \) relative to current projections. These are not really "debts." Cutting them does not entail formal default. Beneficiaries cannot sue, grab assets, and most of all cannot run or refuse a roll-over. All they can do is vote. I suspect that markets are betting on eventual entitlement reform. The equation can hold ex-post from massive negative returns, i.e. an eventual default or large inflation, after a large amount of additional debt has been issued. Naturally, that must be unexpected. More growth is the most sunny possibility. If r-g is 2 minus 1, all it takes is one percentage point more sustained growth g to double the value of tax receipts. In my view, that is not an outlandish hope for what tax and regulatory reform could do, along with the fruits of today's software and biotech. This view may also help to account for the market's high valuation of US debt. What about raising taxes? Absent other cures, we are likely to get much higher taxes eventually, but I think they are much less likely to work. With our current preferences for progressive taxation, and on top of state and local government taxes (and their own problems), ten percentage point higher federal taxes are going to put many current economists' dreams, and Art Laffer's fears, of confiscatory high-income and wealth taxation to the test. To think about this issue, I wrote down here the elasticity of the present value of tax revenue with respect to tax rate. The second term is the conventional static Laffer term, which most people think is small. The important point is the third term, which I call the present-value Laffer term. Because r-g is so small, 0.01 or 0.02, it takes only a tiny growth effect effect of taxes to destroy the present value of tax receipts. If Laffer effects take time and affect growth-- if they affect occupational choice, entrepreneurship, long-term R&D investment, business formation and so on -- they can destroy the present value of tax revenue, even though we may never see declines in the level of income. " (Considering labor effort, a higher flat tax rate has equal income and substitution effects, so conventional wisdom assigns a small labor-effort elasticity. One can argue -- more progressive taxes have substitution but not income effects -- and there are many other channels for static Laffer elasticities. But my point is to focus on the third term and dynamic Laffer effects, so I ignore this one here. As a little more \( g \) would help a lot, a little less \( g \) would hurt a lot. Each point of stagnation makes our governments promises more and more unsustainable. I think our most immediate danger is a rise in interest rates. If the real rates r charged to our government rise, say, to 5%, then the service on a 100% debt/GDP ratio rises to 5% of GDP, or $1 Trillion dollars. Now, debt service really does matter, and our outstanding stock of debt really does pose a surplus problem. There are two mechanisms that might raise interest rates. "Not so bad" interest rate rises come as a natural consequence of growth. Higher per capita growth times the intertemporal substitution elasticity equals higher interest rate. If the elasticity is one, the interest rate rise "just" offsets the benefits of higher growth. Conversely, low real interest rates can buffer the impact of lower growth. \(\gamma\) above one and \( r \) thus falling more than \( g \) may be a reason why our current slow growth comes with rising values of government debt. "Really bad" interest rate rises come without growth, from a rising credit spread -- the Greek scenario. If markets decide that the entitlements are not going to be reformed, cannot be taxed away or grown out of, they will start to charge higher rates. Higher rates explode debt service, make market more nervous, and so forth until the inevitable inflation or default hits. In present value terms, higher \( r \) can quickly make the present values on the right implode. This sort of roll-over risk, interest rate risk, or run has been the subject of at least half the papers in this conference. Here, I find the most important implication of this paper's calculations. The paper shows that the US has a very short maturity structure, so higher interest rates turn into higher debt service quickly. The paper shows that a large slow inflation results in a small change in the present value of surpluses. It follows, inexorably, that if a small change in the in the present value of surpluses has to be met by inflationary devaluation, that inflation must be large, and sharp. If \( x \) is small, \(1/ x \) is large. We live on the edge of a run on sovereign debt. The US has a shorter maturity structure than most other countries, and a greater problem of unresolved entitlements. Despite our "reserve currency" status, we may actually be more vulnerable than the rest of the high-debt, large entitlement western world. That, I think, is the big takeaway from this paper -- and this conference. "So seignorage is probably capped for the US at something like $50 billion per year, and not really going to make a dent." In 2015, the Fed returned $100 billion to the Treasury. By issuing short-term debt (interest-paying reserves) and buying long-term debt (mortgages and Treasury bonds), the Fed can generate large profits. In an inflationary scenario, we could imagine that the Fed would pay little or no interest on reserves and acquire long-term debt with high nominal yields, because of the Fisher effect. I like that this version has an elephant in it! Excellent command of some simple difference equations. Another example is from history rather than pure math: Bernanke et al in a 2002 draft of their FAVAR paper using Granger-econometrics showed Fed policy shocks from 1959-2001 only accounted for a 3.2% to 13.2% change (out of 100%) of real effects on a variety of variables, like GDP, employment, and the like. Shorter version: people anticipate changes, and money is largely neutral short term and long. Perhaps it was different in the Great Depression when people were less sophisticated and union membership, which peaked in the 1950s in the USA, was greater, but nowadays prices, wages are flexible and instruments are pegged to inflation. How about financial repression? We say it for most of the 40s. Is financial repression possible in a world of free flowing capital and free exchange rates? Can we really force US banks to hold ever greater larger of Treasuries forever without a knock on effect to growth rates? Couldn't congress direct the Fed to exchange all of the treasury securities it holds for equal face value of new 100 year bonds? Term structure changes overnight. True the fed suffers balance sheet loses as it normalizes rates, but everyone keeps saying that the balance sheet of a central bank is nothing to worry about. "Social security is explicitly indexed..."
It's even worse than that. Social Security is only indexed when there is positive inflation. During deflation, Social Security benefits are not indexed down. During that short period of deflation during 2008-2009, social security payments were held constant in the presence of deflation. "Have governments ever implemented nominal income cuts on retirees? "Recent history in Japan suggests both yes and no. COLAs for public pensions in Japan are fully linked to changes in prices, as in the United States. When Japan first went into deflation in 1999–2001 and prices declined by 0.3 and 0.7 and 0.7 percent, respectively, nominal cuts in benefits to Japanese retirees were not implemented. Instead they were frozen and the real value of pensions during this period of deflation thus rose by 1.7 percent. On the other hand, the Japanese government, in an attempt to claw back this real increase in pension benefit levels, will reduce future increases, once inflation returns to Japan, thus easing the adverse long-term fiscal impact on the pension system. However, as deflation in Japan continued after 2001, corresponding nominal cuts in annual benefits were implemented mirroring price declines of 0.9, 0.3, and 0.3 percent from 2002–05. Prolonged periods of deflation thus eventually led to nominal pension benefit cuts." If you want entitlement reform, start there. "The principal is adjusted downward, and your interest payments are less than they would be if inflation occurred or if the Consumer Price Index remained the same. You have this safeguard: at maturity, if the adjusted principal is less than the security's original principal, you are paid the original principal." This was not always the case. The U. S. Treasury Department (under Jack Lew's direction), implemented this policy shortly after he was approved as Treasury Secretary. "Here, I find the most important implication of this paper's calculations. The paper shows that the US has a very short maturity structure, so higher interest rates turn into higher debt service quickly." Only because the U. S. Treasury decides to sell bonds that make regular interest payments. 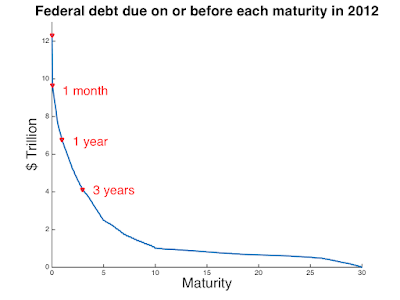 With accrual (aka zero coupon bonds), interest payments and principle are paid at maturity. Higher interest payments can be offset by selling zero coupon bonds and extending maturity out until as you say "the eventual end of the Earth when the sun becomes a red giant". Obviously problematic when you consider that individual investors might want to realize their returns before they perish and the government would be chasing term premiums out to ridiculous durations. Consider selling equity instead. Equity sold by the federal government should be zero coupon securities only redeemable in fulfilling a tax liability. In that way returns on investment are contingent on overall economic activity. As GDP growth rises, so do realized returns on equity. As GDP growth shrinks, so do realized returns on equity. Notice how this differs from TIPs and Social Security? The reason for equity, zero coupon securities, and redemption through the Internal Revenue service is simple - it can be implemented by the Executive Branch of government (President / Treasury) without exercising a plenary power given to Congress by the Constitution. But that level of understanding of both economics and Constitutional Law may be too far above our current administration. I like the point that entitlements dwarf everything else and their cost rises with prices, so inflation doesn’t help with the real problem, in both senses of "real". MMT has had this stuff sorted for years and as follows. For a given rate of interest and given deficit, government has no choice as to the amount of national debt (ND). Reason is that national debt is an asset as viewed by the private sector, plus it is an asset which is virtually the same thing as money, as explained by Warren Mosler and Martin Wolf. Plus the more "money / debt" the private sector it has, the more it will spend. Ergo if the private sector has an insufficient supply of "money / debt", demand will be inadequate (Keynes's paradox of thrift). Alternatively given too much "debt / money" demand will be excessive. Dropping the "given rate of interest and deficit" assumption, if ND is inadequate, obviously that can be made good by a larger deficit, but that of course just results in the private sector eventually having more “money / debt”. As to interest rates, if they are raised, the private sector will obviously hold a bit more ND, and if they are lowered, the private sector will hold less. I don’t see that much else needs to be said on this subject. Social Security payments are indexed to inflation, but social security tax brackets are not. Of course, it's anyone's guess how long that policy would continue were inflation to begin substantially reducing the real value of net social security payments. That represents an annual change of about 3% per year. I was talking about taxes on social security benefits (i.e. the taxes paid on the social security benefits received during retirement), not payroll taxes (the wage base). I can understand the logic of this. If Social Security really is an insurance program (rather than a giant piggy bank) then obviously those that are well to do (even though they contributed to the program) should not collect on their contributions. Should All State or Farmers send you a check back after you paid them auto insurance while you owned a car and never had an accident? There have been numerous failed attempts to means test Social Security. "Should All State or Farmers send you a check back after you paid them auto insurance while you owned a car and never had an accident?" I think that applies more to something like welfare than it does social security. Social Security is a policy of paternalism - that the majority of americans cannot properly plan their retirement savings. Given that, its very reasonable to expect to receive back contributions you've paid into. "...that the majority of americans cannot properly plan their retirement savings...."
If you have properly planned your retirement savings, should you be a recipient of Social Security payments and / or should you pay taxes on those payments? The Federal Government seems to dance the line between here - they send you Social Security payments (even if you have other income) but then they tax you on those Social Security payments because you have other income. Exactly. Read the MMTers. Also, I find it hilarious that "the US is living on the edge of a run" on our debt, the safest asset in the world. Stop comparing US debt to Greece. We can always pay for our debts, we print our currency. If this causes inflation, then the nominal burden of the debt would shrink anyway, so it's a win win. I see low rates for a long time in the future because of private debt burdens, so this won't be a problem anyway.